The 5A-HV-UBEC is a switch-mode DC-DC regulator supplied with a 3-10 cells lithium battery pack and outputs a consistent safe power for your receiver, gyro and servos. 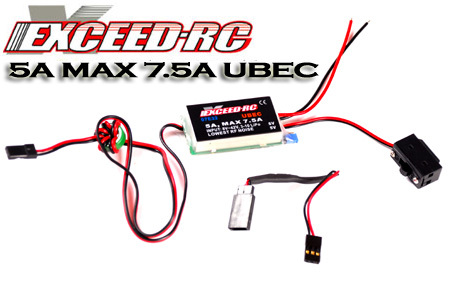 It is very suitable for big electric RC models. Using this UBEC, the receiver can obtain the power supply directly from the main battery pack, so the additional battery pack for receiver is unnecessary. Compared with the linear mode UBEC, the overall efficiency of the switch-mode UBEC is much higher, so it can extend the working time of the receiver battery pack, and because a switch mode UBEC can significantly reduce the heat emission, it can avoid the loss of control caused by the over-heat problem which is frequently happened with the linear mode UBEC. 2.1 Designed with an advanced switch mode DC-DC regulator IC, the max efficiency of the chip is up to 92%. 2.4 A metal shield covers almost all the electronic components, and a filter is attached with the output wires to significantly reduce the electromagnetic interference. 2.5 With ultra-wide input voltage from 8V-42V. 2.6 Safe power on with the polarity protection function. If the input polarity is not correct, the UBEC can't work, but it will not be damaged. What you need to do is just swapping the battery pack's polarity. 2.8 It has a switch to turn on or turn off the output. 2.9 With a step-down voltage regulator of 0.7V down as an accessory (From 6.0V to 5.3V).